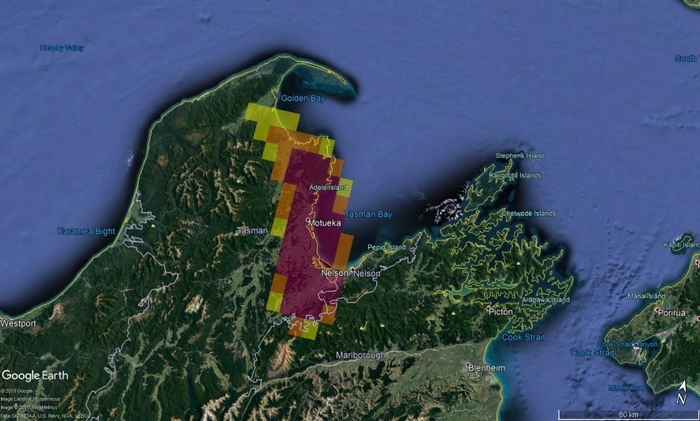 Scion’s Rural Fire Research team has forecast the likely path of the smoke plume from the huge forest fire burning in Pigeon Valley near Wakefield, Nelson. The smoke plume footprint provides a good indication of where the smoke will go for today (Feb 7 - 8), based on forecasted weather and wind directions. The areas most likely to be affected with potentially unhealthy levels of smoke on Thursday 8th are those close to the fire (Dovedale, Stanley Brook, Tapawera, Kohatu, Motueka Valley, Ngamoti, Wakefield, Belgrove). Smoke is predicted to go towards Upper Moutere, Redwood Valley, Mapua, Tasman, Motueka, Wakefield, Brightwater, Richmond and possibly Nelson City on Friday morning (0300 and onward) and remain in this direction throughout the morning. If the fire were to flare up this smoke impact could be heavy. Even with low levels of burning, thick smoke may be observed in the early mornings. If the fire keeps burning, highways could be affected, particularly in the early mornings and evenings and smoke could be a health and visibility risk in narrow valleys. If the fire were to flare up the model indicates that the smoke will travel north, north-west, west and south-west. Hourly averages of fine particulate matter concentrations (PM2.5) are shown. Anything orange or purple indicates higher probabilities of harmful smoke, while yellow indicates the extent of the smoke plume but is generally not considered harmful to public health. People with asthma or other breathing conditions may be severely affected and should avoid exposure where possible by staying indoors with windows and doors closed. However, for most people, the smoke will be unpleasant but not a major risk to their health. The forecast was produced using a real-time smoke and fire spread prediction tool being developed by Scion’s Rural Fire Research team as part of its MBIE-funded ‘Preparing NZ for Extreme Fire’ research programme. The model is for active fire burning in heavy pine forest fuels, so provides worst case probability of smoke concentrations, and therefore these should be used as indicatory only. Check the Rural Fire Research team’s blog for updates. Contact Show email for more information. Smoke prediction for Friday 07-Feb-2019, at 12pm. Smoke impacts: yellow - light; orange - medium; purple - heavy.